Even though the majority of my meals in Atlanta consist of trying out the latest & greatest, there’s something to be said for revisiting the “old” standbys. It was this desire to rekindle a relationship with local favorites that lead Jennifer and I to ONE. Midtown Kitchen. Much like Fritti, I’ve enjoyed many quality outings at ONE. 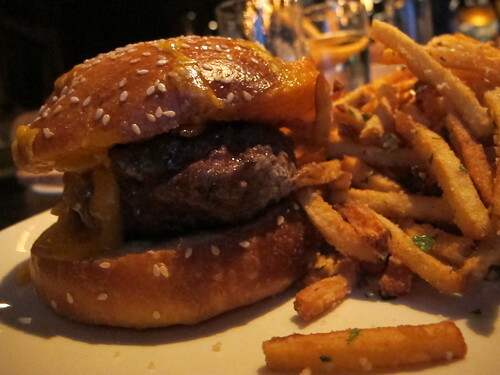 Midtown Kitchen, but like many great avenues, it gradually grew out of sight out of mind. Of course, ONE. Midtown Kitchen’s concealed in a cul-de-sac location doesn’t always help. Location aside, it was time to see if ONE. Midtown Kitchen could still serve up the quality fare of my memories. Even though ONE. Midtown Kitchen is known for their house cured meats, I decided to save those for another time and see how they handled ocotopus. 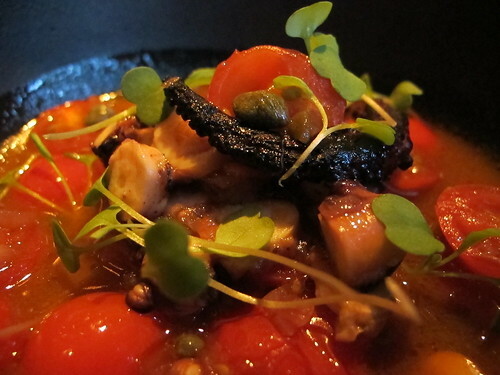 Wood grilled day boat octopus with sweet 100’s, red onion, capers, and braising jus made for an engaging mixture of sweet, salty and smoky. 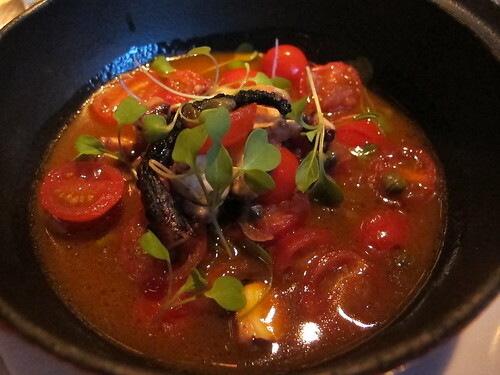 There may not have been very much octopus in this plate, but what was there was beautifully tender. 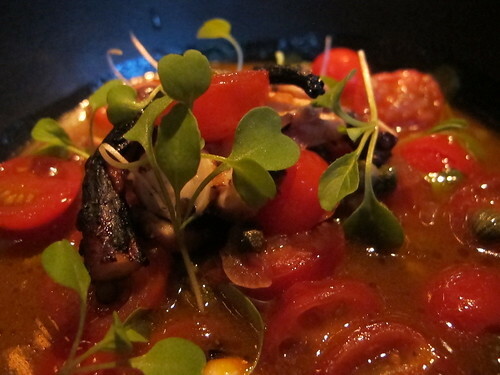 With the octopus quickly consumed, it quickly became a matter of finding enough bread to enjoy the sublime sauce. 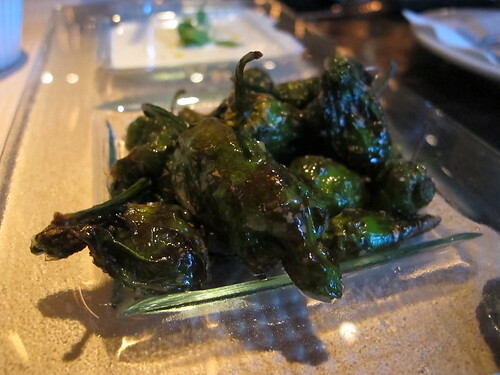 Another appealing item from the appetizer section was the fried padron peppers. I was actually expecting a more refined version of a jalapeno popper, but this was more a dish of well fried, but not too spicy peppers and an oddly lacking cheese sauce. I was hoping there’d be more pungency to the goat cheese sauce if only to play foil to the peppers. 50% brisket and 50% top round, those were the only words I needed to see before I ordered the ONE. Midtown Kitchen burger for my entrée. 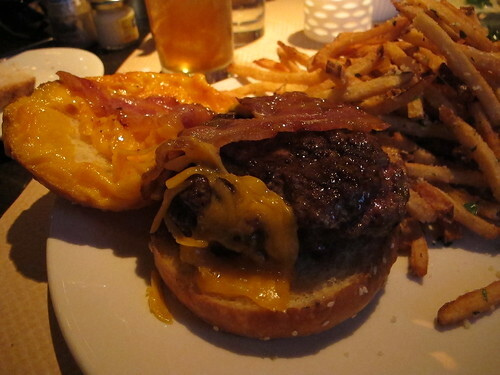 Topped with cheddar gratin and house pancetta and served with a side of parmesan fries, it had the looks of a fine burger. 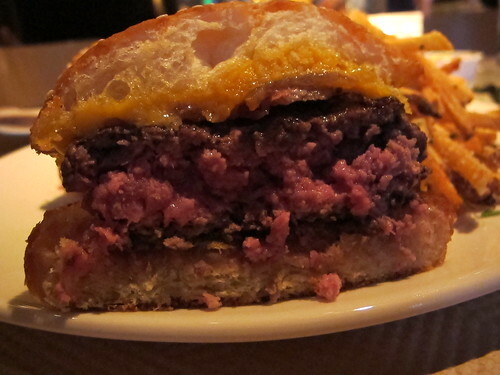 With a well-seared, well-defined crust, this burger was cooked a perfect medium rare. From the first taste, I thought this burger needed pepper but even with that addition each bite was dominated by the salty punch of pancetta. Even the beautifully melted cheddar gratin took a back seat to the pancetta salinity. 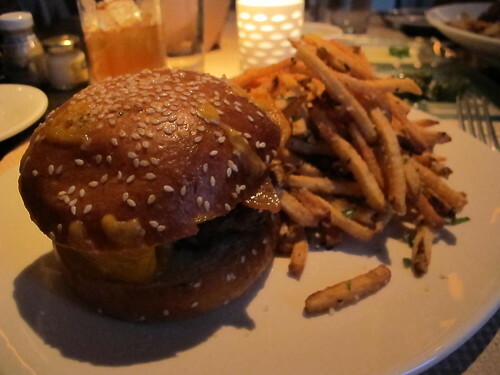 Don’t get me wrong, this was still a fine burger, but the house pancetta definitely took center stage. 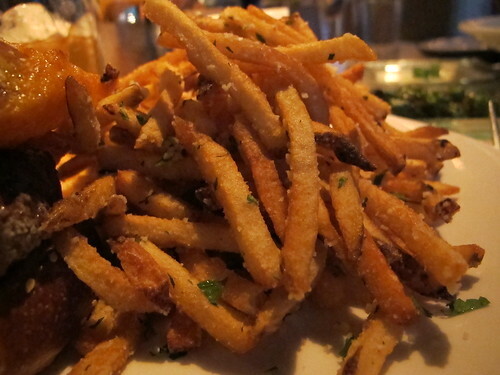 What about the Parmesan herb fries? These fries were everything I could hope for in Parmesan herb fries, they were crispy and coated in a handsome amount of Parmesan, garlic, and herbs. They were rich. Even with several years between visits, ONE. Midtown Kitchen didn’t miss a beat. The waitstaff is still friendly and attentive, the cocktails well made, and the food, minus a slight salty setback, is still up to par. While I hope it isn’t another four years before my next visit to ONE. Midtown Kitchen, I’m fairly certain that next time I’ll receive the same level of quality as before and that is what has made ONE. Midtown Kitchen a midtown mainstay.